A thunderous applause for Quiet! Every once in a while a book comes out that affect me so much that I cannot resist the urge to say to everyone, “You should read this book now!”. Quiet is one of these books. As you may guess, I’m an introvert. Deep inside of me, I always knew introversion could not be so bad. But there was school. Then, work. Noisy open spaces, teamwork, large meetings, unexpected presentations to deliver, annual seminar. Everyone is expecting from me to speak while the thing I prefer the most in these occasions is just to listen. Is that a problem? Should I change? We all face such questions even if we are convinced there is no problem. That was before the Quiet Revolution. Susan Cain spend 5 years writing this fascinating, empowering book, thoroughly researched (just look at the bibliography to see the fantastic work she did). Quiet dispels in the most brilliant way the myth that you have to be extroverted to be happy and successful. This life-changing book clearly demonstrates they are profound advantages to being this way, but also challenges us to get out of our comfort zone. Indeed, introverts can lead effectively or even give winning speeches (e.g. the Susan’s TED talk), provided that we choose the right subject to find meaning in our actions. Do not be mislead by the title. Everyone will benefit from the insights on this important book. Extroverts, introverts, ambiverts, we all need to better understand our differences to get the best of each of us. No other aspect of the personality influences more who we are, how we make conversation, and resolve conflicts. 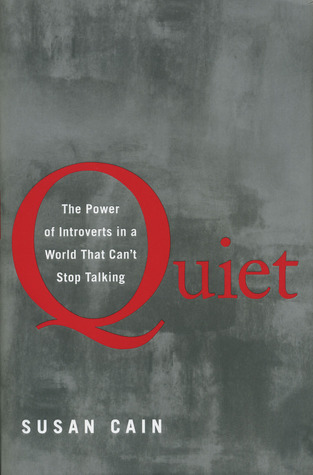 If we consider at least one-third of the people are introverts, every manager, every Human resources employee, every teacher, or just every parent deserve a copy of this book.